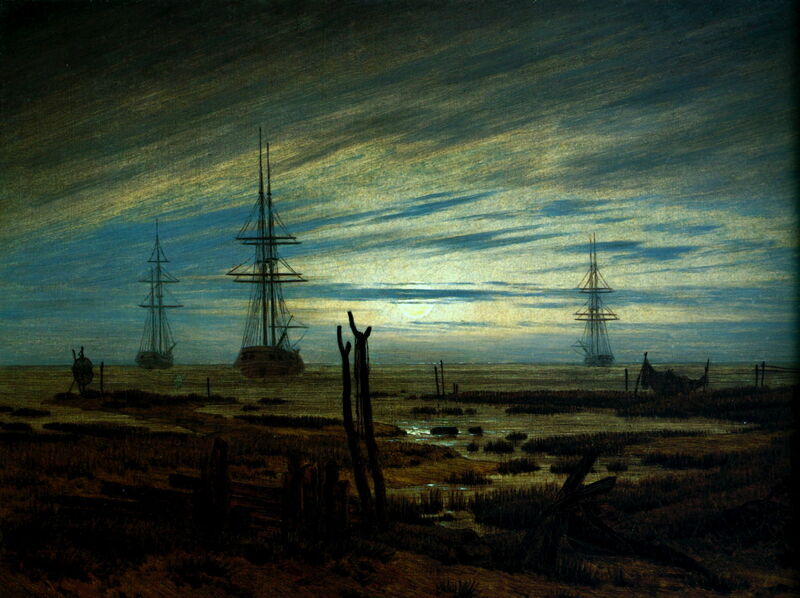 Caspar David Friedrich (1774–1840), Die Lebensstufen (Strandbild, Strandszene in Wiek) (The Stages of Life) (1834-5), oil on canvas, 72.5 x 94 cm, Museum der bildenden Künste, Leipzig. Wikimedia Commons. Caspar David Friedrich (1774–1840) was a Romantic painter noted for his enigmatic landscapes which have provoked much speculation in interpretation. He was born in Greifswald, near the Baltic coast of north-east Germany, when it was still part of Swedish Pomerania, and considered himself to be part-Swedish. However he opted for German nationality and worked for most of his life in the city of Dresden, which is almost as far from the sea as you can get. Caspar David Friedrich (1774-1840), Chalk Cliffs on Rügen (after 1818), oil on canvas, 90.5 × 71 cm, Museum Oskar Reinhart am Stadtgarten, Winterthur, Switzerland. Wikimedia Commons. Several of Friedrich’s paintings look as if they might contain narrative. 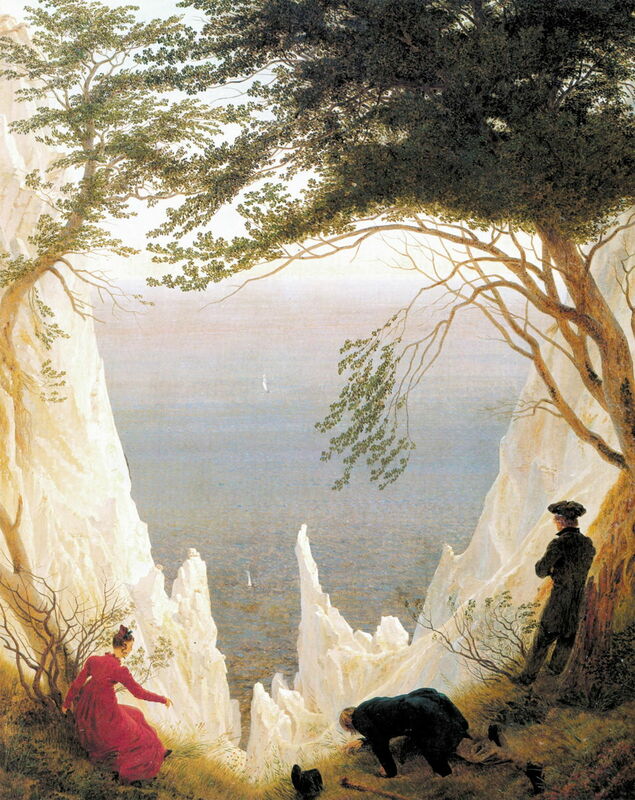 For example, his Chalk Cliffs on Rügen (after 1818) seems to show Friedrich and his wife on honeymoon, but there is a third person wearing a tricorn hat whose presence is hard to explain. Caspar David Friedrich (1774–1840), Morning (Boats leave) (c 1816–1818), oil on canvas, 22 × 30.2 cm, Lower Saxony State Museum , Hanover, Germany. Wikimedia Commons. Earlier in his career, Friedrich painted several motifs including sailing vessels which are not dissimilar to those shown here. 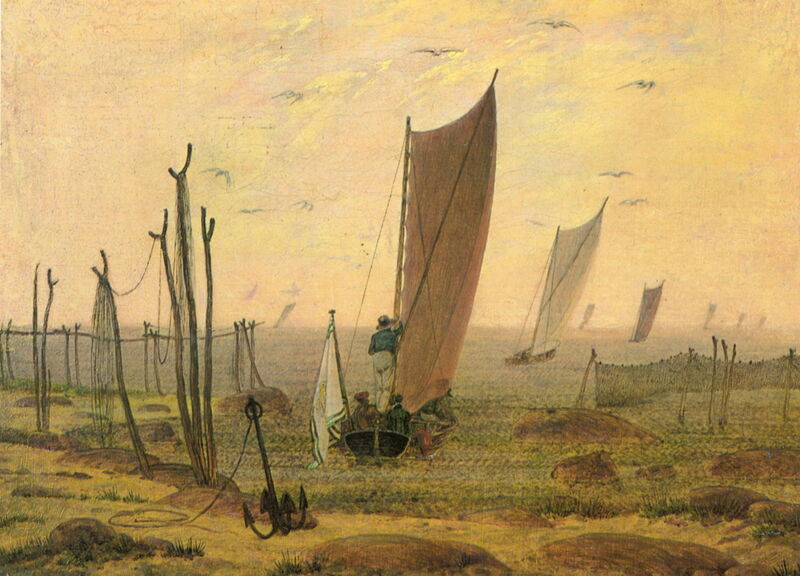 In his Morning (Boats leave) (c 1816–1818), a series of small boats are seen leaving the coast. Although shadows are not shown, this view appears to look north-east, and the vessels are for leisure rather than fishing. Caspar David Friedrich (1774–1840), Ships at Anchor (before 1820), oil on canvas, 30 × 21 cm, Private collection. Wikimedia Commons. Ships at Anchor (before 1820) shows three larger ships at anchor just off the coast. This view appears to be looking west into the setting full moon, although it is a strange light whatever it was intended to show. It is generally stated that his The Stages of Life (1834-5) is set at dusk. It shows five figures and assorted fishing equipment at the water’s edge, with five vessels sailing behind them. Two of the figures are children, who raise a small Swedish flag between them, a reminder of Friedrich’s origins. To their right is a young woman, pointing and looking towards the children. To their left is a mature man, wearing a top hat, who is turned towards an elderly man, the closest to the viewer, his back towards us and a walking stick in his right hand. The younger man is gesticulating, his right hand towards the old man, his left pointing down towards the children. 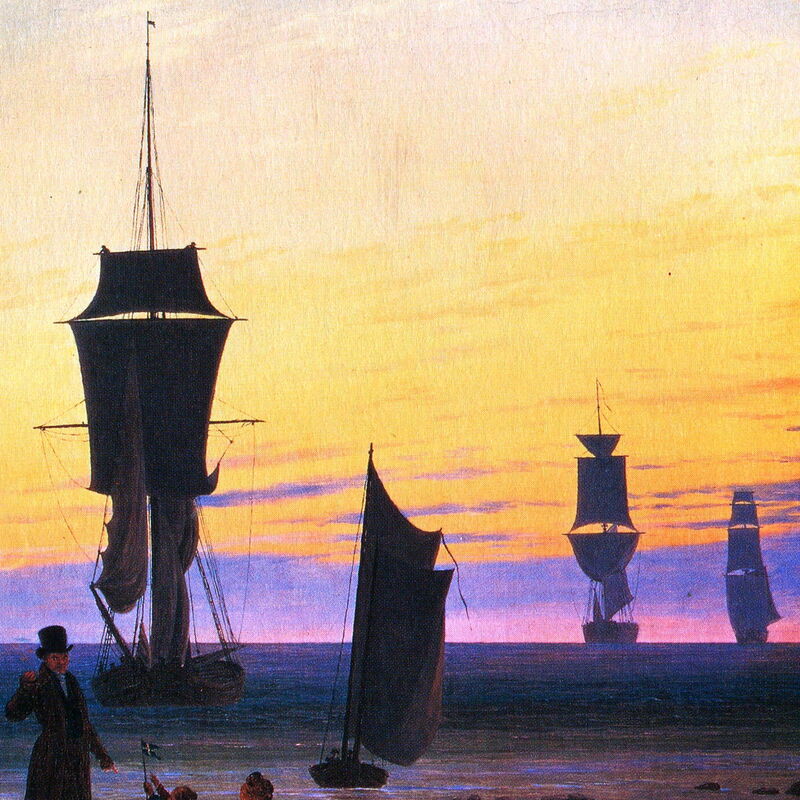 Caspar David Friedrich (1774–1840), Die Lebensstufen (Strandbild, Strandszene in Wiek) (The Stages of Life) (detail) (1834-5), oil on canvas, 72.5 x 94 cm, Museum der bildenden Künste, Leipzig. Wikimedia Commons. The vessels seem to mirror the figures. Closest in to the shore are two small fishing boats under full sail, heading towards the nearest of the three ships. Out in the deeper water behind them is a fully-rigged ship in the process of furling its sails. Further in the distance is a larger fully-rigged ship, also furling its sails, and on the horizon is the fifth, large ship, its sails still fully set. This well-known painting has been interpreted as showing, in both figures and vessels, the ‘five stages of life’. Neither of the children is a baby, and their corresponding vessels are of similar size too. The children and two younger adults appear to form a family group, with the obvious visual reference to Sweden. It has also been claimed that this painting is set on the beach at Utkiek, on the north-east German coast by Friedrich’s native Greifswald. If that is the case, then it cannot be depicting dusk accurately, as that part of the coastline faces east. If it is at that location, then it is either set at dawn, or Friedrich added the dusk effect contrary to the geography. It is often stated that there are five ships. There are not: the two vessels closest to the viewer are small boats used for fishing, and for ferrying passengers and cargo between the shore and ships at anchor; they are being navigated away from the shore towards the closest of the three ships. There are three ships, each of which is sailing towards the viewer and the coast. The five figures on the shore do not have a chest or other luggage with them. 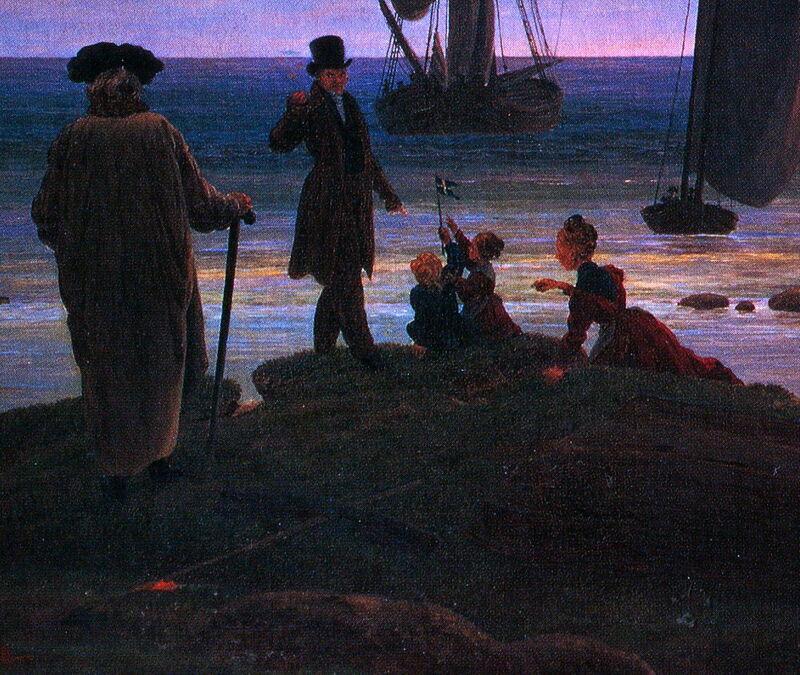 Although it is possible that the small boats are already ferrying their luggage out to the nearest ship, it seems most unlikely that Friedrich intended the viewer to interpret the painting as showing the departure of the figures. Furthermore the two children and young woman are not dressed for a sea voyage, although the two men could be. 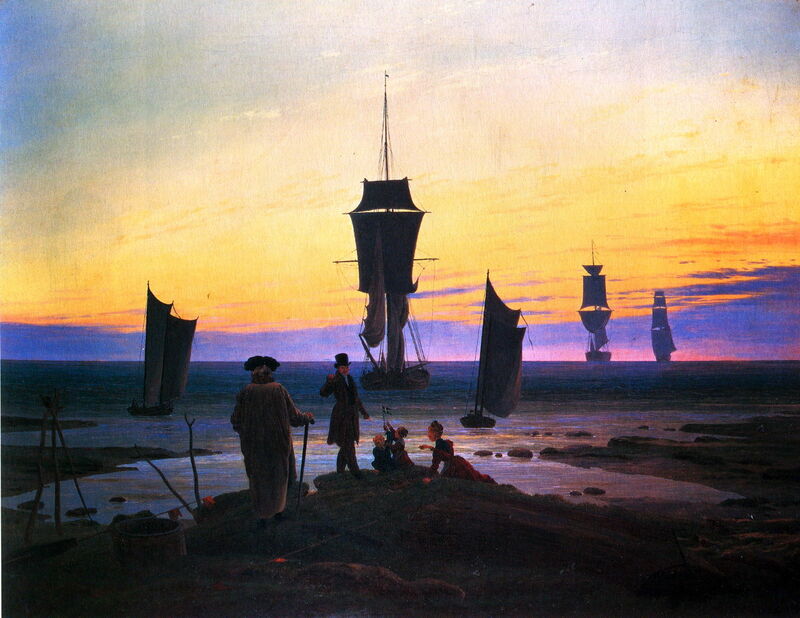 At the time of this painting, Friedrich himself was sixty years old, his wife was 41, their oldest child Emma was 24, her younger sister Agnes was fifteen, and his son Gustav was ten. It is therefore most probable – as is usually claimed – that the three younger people shown here were his three children, that the top-hatted man standing with them was not Friedrich himself but his nephew Johann, and that Friedrich could instead be the man in the tricorn hat. Friedrich’s wife is conspicuous in her absence. Most worryingly, it seems that this painting was only dubbed The Stages of Life in the late nineteenth or early twentieth century, when there was a revival of interest in Friedrich’s paintings. Yet that posthumous title has coloured every interpretation of it since, inviting viewers to see the painting quite differently from the way that it is. I do not think that this painting attempts to depict, directly or by allegory, any stages of life, nor its figures departing on any journey of life, as those are inconsistent with the painting itself. It does clearly show some narrative involving Friedrich and his family, but without much deeper insight into their life at the time, or an explanation by Friedrich himself, its story will remain enigmatic. Hofmann W (2000) Caspar David Friedrich, Thames & Hudson. ISBN 978 0 500 09295 8. Piotrovsky MB et al. (2008) Caspar David Friedrich & the German Romantic Landscape, Lund Humphries. ISBN 978 1 84822 017 1. Posted in General, Painting and tagged allegory, Friedrich, narrative, painting. Bookmark the permalink. Thank you! Hard to find posts on classical art these days.